Taiwan recently broke ground on a trio of interconnected energy-efficient skyscrapers topped with lush rooftop gardens. Designed by Los Angeles-based NBBJ Architects in collaboration with Fei & Cheng Associates, the Chinatrust Bank Headquarters will take advantage of a host of green building strategies geared towards reducing energy consumption and optimizing passive heating and cooling. 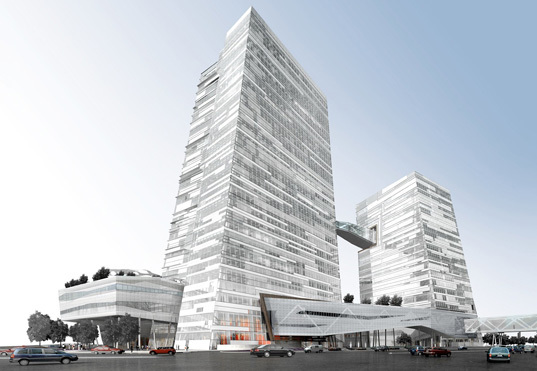 The complex is expected to receive the Taiwanese equivalent of a LEED Gold rating upon its completion in 2012. Inspired by principles of informal connections and communication, the 2.5 million square-foot Chinatrust complex comprises three high-rises: a 30-story headquarter building, a 21 story office, and a 10 story hotel. A community-centered retail base will occupy the lower 4 levels, and an open-air central plaza will unite all of the spaces into one cohesive unit. NBBJ Architects paid careful attention to the project’s site and climate to optimize each building’s passive heating and cooling properties. The towers feature vertical atriums and cutting-edge facades that are optimized to channel daylight throughout the interior spaces. The top of each skyscraper will feature a rooftop garden that helps to insulate the interiors, reduce rainwater runoff, and mitigate the urban heat island effect. Why is the plaza all paved? Why not leave some grass? According to the American Institute of Architects (AIA), buildings are the leading source of greenhouse gas emissions in the United States. According to estimates in the AIA's Architects and Climate Change report, buildings represent 48 percent of carbon dioxide emissions, with transportation and industry representing 27 percent and 25 percent respectively. Some people argue global change is normal state, that there is no proof of human impact on climate change, it is just a normal process humans have no impact on. Climate change may have normal cycles but there is nothing historically normal about the human population explosion and the impact that their energy consumption and pollution has on the earth’s bio systems. Many independent thinking people believe that the individual CAN make a difference. However, working in conjunction with Architects we could do a lot more. Not only do high concentrations of people in mega buildings ,as seen in this article, concentrate green house gas, but building these high-density buildings also increases the surface area on, if not of, the earth that can absorb heat. It is not just office towers; residential condo towers are creating increasingly dense urban and coastal areas that contribute to the formation of “heat islands” and global warming by adding heat-retaining surface area. Any city resident knows that it is often 10 degrees warmer in the city than the suburbs or rural areas around them. The Green Roof movement is great, but the ratio of wall to roof area is much greater on high rise buildings. If Architects designed balconies with drainage and water spigots built into their clients high rise buildings, it would allow residents and offices to help offset their impact to a far greater degree both in terms of cooling and exchanging oxygen for carbon and absorbing other pollutants. Successful landscaping and gardening on balconies and rooftops, especially of condo towers, has many challenges that residents with terrestrial gardens in homes don’t share, especially if the building Architect is not on the same page. Balcony and rooftop gardening, however, can help offset the green house gas emissions and despite the difficulties in cooling these heat islands, it is a worthy endeavor within the grasp of individuals. I have created a blog to help make it easier for the individual to do this at http://planterblog.com/blog/ and I welcome constructive input and listing from Architects that feel the same way.